a tiny dog attacks its owner every time he is given the middle finger. Rihanna is blown away with a concertgoer with an impressive voice during her ANTI tour. mexican hero crashes anti-immigration protest. the white supremacists aren't too happy either. 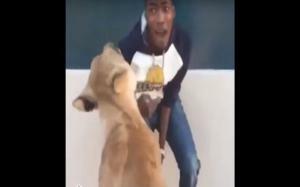 Man runs in extreme panic when he is chased by a caged lion after losing a bet. A woman from Atlanta causes a stir on social media with her interesting pronunciations on Jeopardy. young people across america take part in the ridiculous new #condomchallenge on social media. i got a question for you...what are tse?! An MLB player entertains his team during a rain delay with his version of the "Gangnam Style" dance. a golfer has his head stuck in a trash can and his friends poke fun at him. 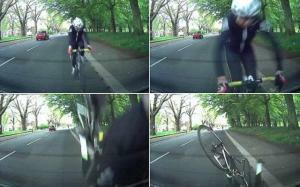 A distracted cyclist crashes into a parked car while fidgeting with his bike equipment. 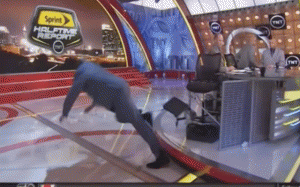 Shaq takes a tumble during an NBA halftime report, and the internet makes fun. 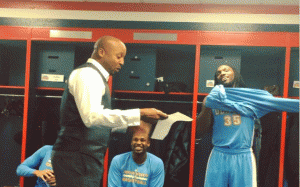 Video of former Denver Nuggets basketball coach Brian Shaw, attempting to rap a scouting report for his players' attention. actor dennis quaid is recorded having a meltdown while on the set of a project.